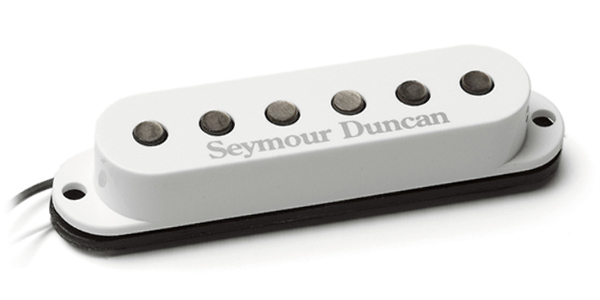 The Seymour Duncan SSL-3 is a dual output true single-coil pickup for warm instruments. The tapped portion has a bit more than half the output as in full output mode. In full output mode it is Seymour Duncan's hottest traditional single coil Strat® pickup. Recommended for country, pop, blues, classic rock and heavy rock. This is the next step up from the SSL-5 with more sustain, fullness, and output - and less treble response. This is Seymour Duncan's hottest traditional single coil Strat® pickup. Recommended for country, pop, blues, classic rock and heavy rock. The raised flat Alnico 5 pole pieces are taller for a stronger and deeper magnetic field. Extra coil windings provide extra power making this pickup great for heavier music styles. White cover included. This pickup is Reverse Wound and Reverse Polarity for installation in the middle pickup position of a Strat to provide hum cancelling in selector switch positions 2 and 4.